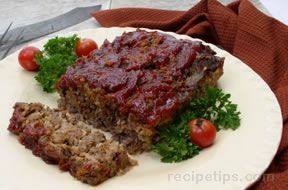 Meat loaf with ketchup is a traditional family favorite. Bag 'n Season® makes it easy. 1. Preheat oven to 350°F. Arrange opened Roasting Bag in 13x9-inch baking pan. Add flour to bag; shake to coat well. Mix Seasoning Mix with bread, egg and 1/4 cup of the ketchup in large bowl. Add meat; mix well. Shape into 8x4-inch loaf. 2. 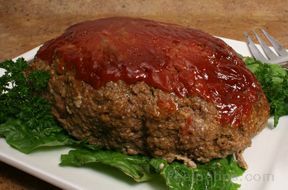 Place meat loaf in bag. Pour remaining 1/2 cup ketchup over top. 3. Close bag loosely with nylon tie. Cut 4 small holes in top of bag to allow steam to escape. 4. 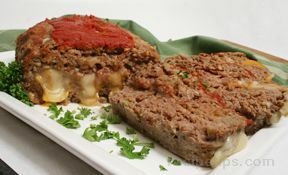 Bake in lower half of oven 1 hour or until meat loaf is cooked through. Let stand 5 minutes before serving. Test Kitchen Tip: Use 3 tablespoons dry unseasoned bread crumbs in place of crumbled bread. Bag 'n Season Tip: Allow 8 inches for bag to expand while cooking. Roasting bag should not touch oven walls or racks.